Hello and welcome to the 107th installment of the SWD. Syrian Arab Army captured the village of Al-Ulwah from Islamic State in eastern Aleppo countryside. Islamic State once again targeted the village of Al-Karmah, southeast of Deir Hafer, with two anti-tank guided missiles. According to Amaq’s statement, Syrian Arab Army’s tank and an artillery piece were destroyed with the missiles. Syrian Democratic Forces captured Al-Assidiyah from Islamic State north of Raqqa, after the capture of Al-Assidiyah clashes between SDF and IS erupted south of it around the 17th Division military base. 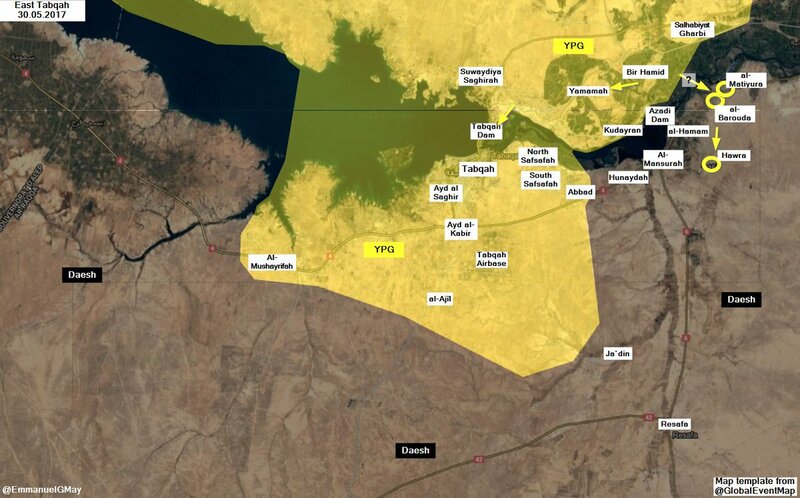 SDF also advanced on another front, east of Tabqa they captured villages of Al-Barouda, Al-Matiyura and Hawra. Aim of these advances is to besiege Islamic State fighters located in and around Baath Dam. The way these advances east of Tabqa occurred is currently disputed, part of the sources claims it was a naval assault across the Euphrates river, while the other part claims it was a land advance through the desertous area east of Tabqa. Prisoners took control of Hayat Tahrir al-Sham’s prison in Abu al-Duhur, eastern Idlib governorate. Prisoners reportedly seized guard’s weapon, threatened to kill him and made him open the cells, thus releasing all prisoners. Number of prisoners escaped varies between 35 and 50, depending on the source. However, a different story surfaced regarding the events related to the prison break. This story says that a number of Iraqi fighters taken as prisoners managed to overcome the guards and imprison them. After that, the prisoners met up with Syrian Army’s Special Forces in rebel-held territory in Idlib which extracted them to safety. Prisoner exchange took place between Faylaq al-Sham and Ahrar al-Sham on one side and elements of the Syrian government on the other side. Faylaq al-Sham reportedly released four Hezbollah fighters captured in Fuah-Kafraya while Ahrar al-Sham released a Iranian “spy” and handed over a body of one Iranian fighter in exchange for three individuals from Faylaq al-Sham. Among those released individuals from Faylaq al-Sham is one of its commanders, Muhammad Abdul Karim al-Daghim, he was captured in 2016 during the battles for Aleppo. Commander in Liwa Omar, part of Ahrar al-Sham, Sheikh Nasser Hamadeh wounded on the 28th of May by unknown gunmen in Kafr Batikh died due to his wounds in Bab al-Hawa hospital. Free Syrian Army factions led by Maghawir al-Thawra reportedly withdrew from Al-Halbah area 50 kilometers (31 miles) southeast of Palmyra, the area was captured from Islamic State on the 22th of May. After Free Syrian Army’s withdrawal, Syrian Arab Army reportedly entered and captured the area. Jaysh al-Islam started an anti-Hayat Tahrir al-Sham operation in Al-Ash’ari aimed at eliminating the remnants of the group in East Ghouta. After several hours of clashing with Hayat Tahrir al-Sham backed by Faylaq al-Rahman, Jaysh al-Islam proclaimed full control over Al-Ash’ari and expulsion of Hayat Tahrir al-Sham’s remnants from it. 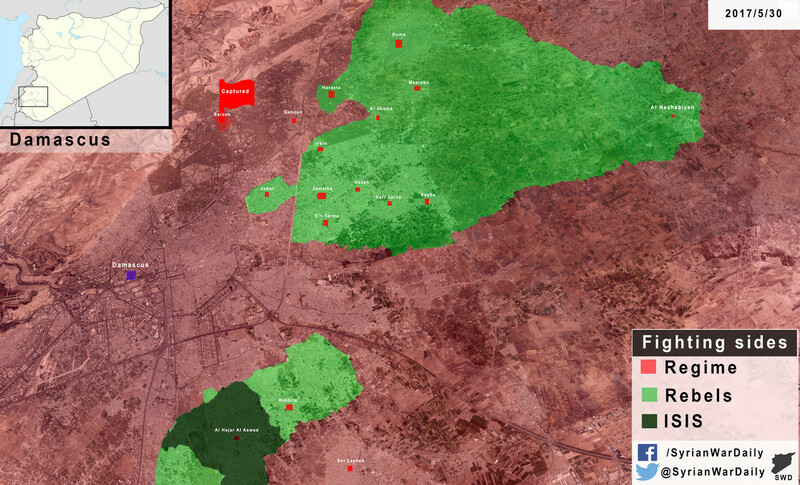 Situation in greater Damascus area after rebels evacuated Barzeh, HD version of this map can be found here. Islamic State reportedly launched a counterattack in Al-Zanjili district of west Mosul, during the supposed the attack IS fighters damaged a bulldozer and captured three Iraqi Army’s positions in the district. Today’s clashes between IS and Iraqi forces focused mainly on Al-Saha district, IS’ SVBIED exploded in it and IS claimed to have destroyed Iraqi forces’ military vehicle as well as looted a bulldozer. 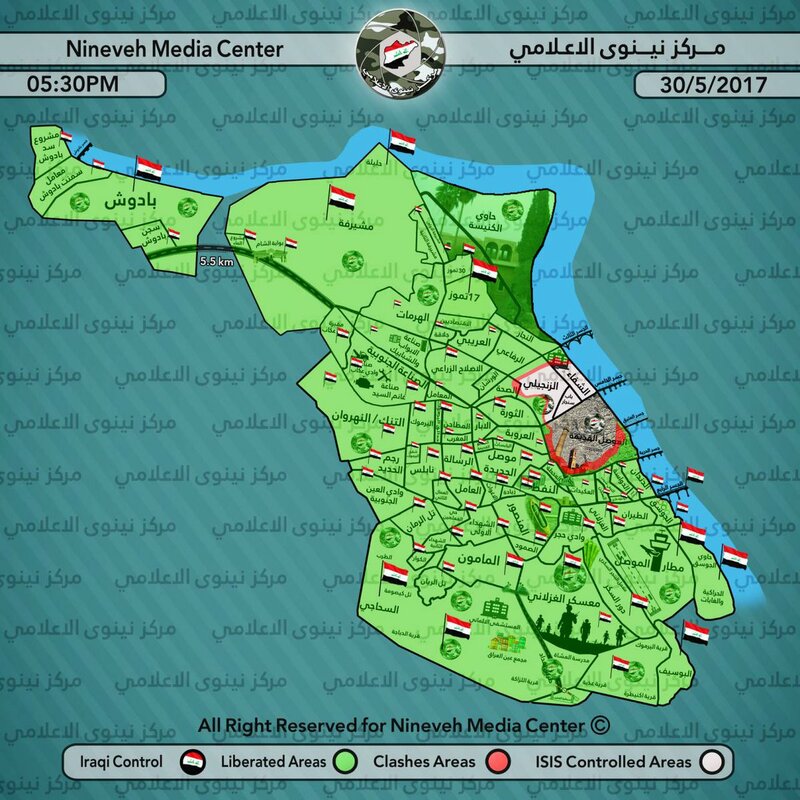 In clashes at the outskirts of Bab Jadid neighborhood in Old Mosul district, Islamic State claimed to have killed eight Iraqi soldiers, including two officers. Islamic State’s Amaq Agency released several statements regarding the events that occurred west of Mosul, in territory newly captured by Al-Hashd al-Shaabi (Popular Mobilization Units). In the village of Al-Khadra, IS’ improvised explosive devices reportedly killed and wounded 13 Iraqi fighters. Other two Amaq’s statements are related to Al-Jayir village, Iraqi forces’ convoy allegedly entered into a minefield near the village which resulted in nine casualties. The remaining claim from Al-Jayir includes IS destroying a Humvee with an anti-tank guided missile. Islamic State’s suicide bomber detonated himself close to civilians and security forces in Hit (Heet), initial casualty numbers suggest at least 15 killed and wounded. Two Islamic State’s SVBIED targeted Baghdad since yesterday, both of the attacks were directed against the civilians. The first SVBIED exploded near an ice cream shop in Karrada district, killing 11 and wounding at least 47 civilians. The second SVBIED exploded near the “Department of General Retirement” causing 37 civilian casualties. Islamic State claimed both of the attacks through its media outlet, Amaq Agency. Amaq reported that the attacks targeted gathering of Shia Muslims and claimed that the attack in Karada killed and wounded at least 53 individuals. On the 29th of May 2017 CJTF-OIR has conducted 18 strikes in Syria. CJTF-OIR‘s main focus in Syria at the moment is Tabqa-Raqqa-Deir al-Zour region where they did 18 strikes supporting SDF‘s operations against IS destroying four IS well heads, an IS oil storage tank, an IS oil tanker truck, six vehicles, a tunnel, a mortar system, a weapons cache, a VBIED factory, three fighting positions, an IS oil separator tank and an IS headquarters.